FRANCE HAS OPENED its first safe-injection room for drug addicts despite years of efforts by conservatives to block the plan. The room, located in northern Paris, opened for a six-year test period as allowed by a health law passed last year by the socialist government. 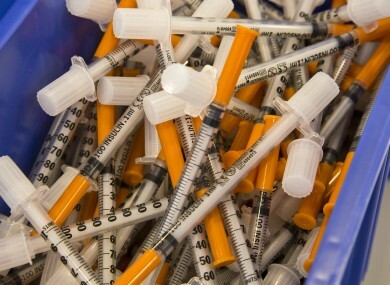 Intravenous drug users will be given free access to clean needles under medical supervision and in the presence of counsellors in an effort to prevent infections and overdoses. Health minister Marisol Touraine said in a statement that the room is an “innovative and courageous response to a health emergency situation”. The room is located in a building near a hospital close to Paris’ Gare du Nord station — a major hub where trains from London and Brussels arrive. The area is also the main site for the consumption and sale of illegal drugs in the French capital, according to authorities. Paris’ mayor, Anne Hidalgo, said she feels “very moved and very proud because what’s being done here is necessary, necessary for the people who are in complete disarray, because they know they have a door they can enter. They can come here, they can get counselling, they can get assistance and get guided toward a life that will get them out of these addictions. French authorities are following Switzerland’s example, where a safe-injection room opened in 1986. Similar rooms now exist in Germany, the Netherlands, Spain, Australia and Canada. Email “France today opened its first ever supervised injecting centre for drug addicts”. Feedback on “France today opened its first ever supervised injecting centre for drug addicts”.